UNITED NATIONS, May 25 -- Beyond the allegations of the UN being complicit in war crimes in Sri Lanka, made by the International Crisis Group, there is an additional question about UN Secretary General Ban Ki-moon's chief of staff Vijay Nambiar role in convincing Tamil Tiger leaders to surrender, which led to their summary execution. Mr. Nambiar's belated defense is that they may have been killed in crossfire or by the Tamil Tigers. He says he was given assurances of "normal" treatment by Mahinda Rajapaksa, Gotabaya Rajapaka and Palitha Kohona -- to whom Mr. Nambiar continues to communicate on the very topic and composition of the group of experts on accountability in Sri Lanka. This is a total conflict of interest. On May 24, Ban Ki-moon reacted "angrily" when Inner City Press asked about this and three ICG allegations, saying, "I totally reject all that kind of allegations." Video here, from Minute 38:07. Two minutes later, in response to a second question from Inner City Press about the ICG report, Mr. Ban said, "I rejected it? I don't know I ever said I reject it." Video here, from Minute 40:07. Inner City Press: Philip Alston has said that a number of LTTE [Liberation Tigers of Tamil Eelam] leaders who were, came out to surrender after having spoken with Vijay Nambiar, the Chief of Staff, were in fact — he believes, Alston believes — summarily executed by the Sri Lankan Government. So the question is... what was Chief of Staff Vijay Nambiar’s role in encouraging them to come out? Spokesperson Nesirky: The Chef de Cabinet has talked about this publicly and made clear that this was, that he had no direct contact with the people who were being asked to surrender. He had no direct contact with them. He spoke to the Sri Lankan leaders and was conveying a message that was relayed to him not by someone from the Tamil community. I will be able to give you the exact ins and outs if you need it, but he has spoken publicly about it. Spokesperson: Yes, yes he has. He did so quite recently in an interview with Al Jazeera. Thereafter, Nesirky declined to summarize what Nambiar had said, or to make Nambiar available for questions. He said, "Ask Al Jazeera." So Inner City Press did. What follows is a transcription sent to Inner City Press on this point. We will have more on this. Q: Since you spoke to so many people and parties that were involved, why do you think things went wrong? Nambiar: I might add that this is only one of the issues that I raised…discussing a whole…the question was that the what happened in the heat of the war I am not aware of, it was something which we had no first hand knowledge about…there have been discussions of this in the press and subsequently there have been some comments make by the Sri Lankan leaders also about whether or not they could have been killed in the crossfire, there was one person who also suggested they said perhaps he could have been killed by LTTE themselves who were not interested in their people surrendering..it could have been killed by the Sri Lankan forces, we are not in a position to make any assessment, certainly I am not. Nambiar: I am not in a position to comment on that, because I don’t have any independent knowledge. Q: Maybe then investigation is necessary? There is more. For now it should be noted that a television interview is not an investigation. It is easy to say that they were "killed in the cross fire" or by the LTTE. This is what an investigation is for -- also, to determine how Mr. Nambiar conveyed back the assurances he received from Mahinda Rajapaksa, Gotabaya Rajapaka and Palitha Kohona -- to whom Mr. Ban continues to converse, as does Mr. Nambiar, on the very topic and composition of the group of experts on accountability in Sri Lanka. This is a total conflict of interest. An external, independent investigation is needed. When Mr. Nambiar says "it is up to the member states," it is in the context of confidence that those who threatened to veto putting the Sri Lankan "bloodbath on the beach" on the Security Council's agenda could likewise block any Council action. This is known as impunity. More to follow, watch this site. UNITED NATIONS, May 24 -- "I totally reject all that kind of allegations," UN Secretary General Ban Ki-moon told the Press on Monday, responding to a question about the UN's involvement in war crimes in Sri Lanka. Video here, from Minute 38:07. 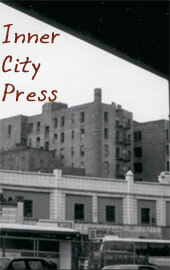 Two minutes later, in response to a second question from Inner City Press, Mr. Ban said, "I rejected it? I don't know I ever said I reject it." Video here, from Minute 40:07. 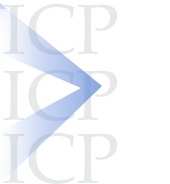 Inner City Press had initially asked Mr. Ban about the International Crisis Group report, which even in the Executive Summary calls for "an independent international inquiry into... the UN’s September 2008 withdrawal from Kilinochchi through to its ineffectual attempts to push for a ceasefire and its involvement in Sri Lankan government internment camps." Would the group of expert Ban committed eighty day ago to name to advise him have jurisdiction over the UN's own actions and inactions? Beyond "totally reject[ing]" ICG's criticism of the UN's and Ban's performance on Sri Lanka, Ban said that his panel would only address "international standards" applicable to the Lessons Learnt and Reconciliation Commission belated announced by President Mahinda Rajapaksa. To some, there was a parallel: Rajapaksa rejected any allegation that his soldiers killed civilians, before conducting any investigation. And at Monday's press conference, Ban Ki-moon totally rejected ICG's call for an "inquiry into... the UN’s September 2008 withdrawal from Kilinochchi through to its ineffectual attempts to push for a ceasefire and its involvement in Sri Lankan government internment camps." To these, Inner City Press added the issues raised by Ban's chief of staff Vijay Nambiar's still murky role in encouraging the surrender of rebel leaders who were then summarily executed. Video here, from Minute 37:16. In fairness, this may have thrown Ban off and led to the rejection then non-rejection. But the UN's own Special Rapporteur Philip Alston has asked the Rajapaksa government about this -- presidential brother Gotabaya Rajapaksa has been accused of ordering the killings -- but has yet to ask the UN's own Vijay Nambiar. Alston's mandate expires in June. So who will investigate? Especially after Ban's "total reject[ion of] all that kind of allegation"? 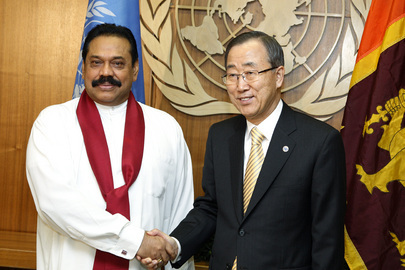 UN's Ban and Mahinda Rajapaksa, united- in "total rejection of allegations"
After Ban announced his intention to name a group of experts "without delay," the Rajapaksa government protested, including seeking and obtaining -- albeit in a late, "non-objection" portion of a NAM meeting in New York -- a letter from the Non Aligned Movement that told Ban he had no jurisdiction over human rights. While some Ban advisors have said they disagree with the NAM letter's logic, the Ban Administration never publicly rebutted the reasoning. And now eighty days have passed without Ban naming even the group of experts. On Monday, Inner City Press asked Mr. Ban why he has delayed these eighty days to pass. With Ban slated to meet with Sri Lanka's Minister of External Affairs G.L. Peiris later on May 24, he said that the delay was "not based on pressure of Sri Lanka." Reading from notes, Ban said he would discuss "accountability.. reconciliation... and improving the conditions" for people, nearly entirely Tamils, in the UN-funded camps. Ban and his advisors should know the G.L. Peiris has publicly refused to provide any timeline for resettling the people still in the camps, and he said that Ban should not even name his group of experts. 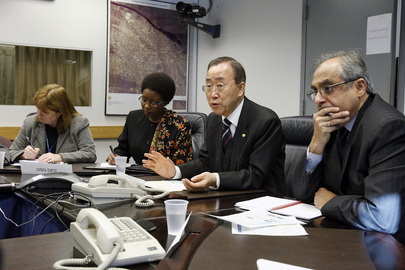 Some ask where does Ban Ki-moon stands, does he reject or not remember rejecting? Footnote: Inner City Press, which covered Ban's trip to Sri Lanka last May and has asked follow up questions at the UN since, had its request to Sri Lanka's Mission to pose questions to Minister Peiris ignored and thus denied. It was sent to Permanent Representative Palitha Kohona, a former UN staffer, but was not responded to. A Mission staffer said arrangements, including invitations to journalists who have never written about or been to Sri Lanka, were coordinated by Kohona's Deputy, who now sends Inner City Press repetitive and abusive e-mailed every day before the UN noon briefing. On Monday, two Mission staffers shepherded G. L. Peiris around the UN on Monday, from BBC to Reuters, and then on to Ban Ki-moon. There is a 3:15 "photo opportunity" and Inner City Press has a right to be there. Watch this space. UNITED NATIONS, May 19 -- As witnesses testify that orders to execute prisoners came from the top of Sri Lanka's government, the UN on Wednesday couldn't confirm it is even following the issue. Inner City Press asked Secretary General Ban Ki-moon's spokesman Martin Nesirky about the much publicized report on UK Channel 4. "I would have to check with colleagues if they are aware" of the report, Nesirky said. Inner City Press asked if the panel that Ban said ten and a half weeks ago would be named without delay would have jurisdiction to look into the UN's own role, described by the International Crisis Group, in war crimes in Sri Lanka. Video here, from Minute 11:12. No, Nesirky in essence replied. He said the panel would only "advise the Secretary General on the extent to which a domestic inquiry in Sri Lanka would meet normal standards." Thus, the delayed Ban panel would not, even if named, be responsive to the calls for investigation made by ICG, Amnesty International, Human Rights Watch and others. On BBC, Louise Arbour of ICG said the government violated the laws of war by blurring the line between combatants and civilians, and that its killings of civilians were not accidents. Palitha Kohona, Sri Lanka's Number One Ambassador to the UN who is apparently letting his Number Two run wild or play bad cop, said he had read the ICG report -- the UN has apparently not finished it -- but that any outside, independent investigation would be "colonial and paternalistic." But how could a panel now named by Mahinda Rajapaksa investigate war crimes claims made against his own brother? On the panel is Kohona's predecessor as Sri Lanka's Permanent Representative to the UN, H.M.G.S. Palihakkara, who defended the blood bath on the beach as it took loomed and took place. 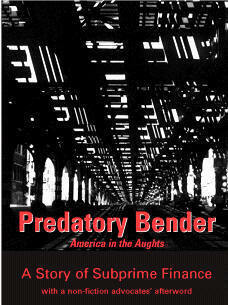 See video here (March 26), here (April 22, and Inner City Press' Q&A report), and here (June 5). Would the UN accept, for example, Sudan's UN Ambassador investigating claims against Omar al-Bashir? Against this backdrop, Nesirky has in two days not provided any of the answers he promised on Monday, including how much the UN spent on Sri Lanka's internment camps, and with what safeguards if any. There has still been no response from the IRIN or Ban's office to what's described as censorship of the ICG report by the UN's IRIN news service. Inner City Press: on Sri Lanka, I wanted to ask, there is a report since our last interchange on Channel 4 in the United Kingdom, citing senior military commanders, that there were orders from the top to kill surrendering soldiers or hardline elements of the Tamil Tigers, saying these orders came from the top, that “we were to leave no one alive”. What I am wondering is, in light of this still either delayed for 10 and a half weeks — however you characterize it — appointing of a panel to advise Ban Ki-moon on accountability in Sri Lanka, are they aware of this report? Does it make it go faster, and would that panel have jurisdiction to advise the Secretary-General on the UN’s own role in, as we discussed, leaving Kilinochi, an ineffective call for a ceasefire, and funding internment camps as ICG [International Crisis Group] has alleged? Spokesperson: On the specific news report that you are referring to on Channel 4, I would have to check with colleagues whether they are aware of it. I do not know the answer to that right now. On the broader question, the Panel of Experts will have the role to advise the Secretary-General on what the standards are for a credible domestic investigation or inquiry. In other words, to address the question of accountability that has been discussed very often. So it is a very specific aim, to advise the Secretary-General on the extent to which a domestic inquiry — meaning in Sri Lanka — would meet normal standards, widely-held standards, for that kind of investigation. So it is fairly specific. Inner City Press: And if you don’t mind, since on Monday, I think, you had said that the Secretariat was going study this International Crisis Group report, which actually made some allegations or called for an international inquiry into the UN’s own conduct. What is the UN’s response to that? Do they think that is appropriate? Given that this Panel would not even do that if named, what is the UN’s response to Louise Arbour and the ICG’s call for an inquiry into the UN’s own actions in this matter? Spokesperson Nesirky: As I mentioned, and as you have pointed out, we said that it is being studied in some detail and that remains the case.